Coin Collecting Reviews: An interesting imitative Anglo-Saxon Tremissis. Circa 6th century AD and 1.21 grams. Imitative of a tremissis of Justinian. Obverse with profile bust right with radiate crown and OOOANVO legend. Reverse featuring cross with forked ends on base with pellet to each side and OOILLVV.VA-IOO- legend. Possibly Unique and interesting British copy of an Anglo Saxon Tremissis, which doesn’t seem to be listed in any of the standard references. Very fine. Found in Cambridgeshire and based on the cross type of Justinian, but on this coin the Emperors head wears a radiate crown, which never occurs on similar coins. It doesn’t appear to be a coin of the Vandals, Lombards or Goths etc. who usually got most of the inscriptions correct. The legends on both sides of this coin are completely garbled comprising principally of the letters O and V.
The cross itself is odd as the top is fourch? whilst the left-hand arm has two forks, as though the engraver had no idea of the significance of what he was engraving. It is possible that the engraver was copying the chi-rho headed cross siliquae of Justinian, which had two stars at the base of the cross. 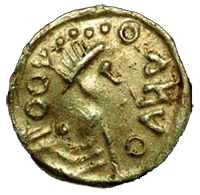 A Tremissis was a currency of Late Ancient Rome, equal to one-third of solidus. Tremissis coins continued to be minted by descendants of the Roman Empire, such as Anglo-Saxon Britain. 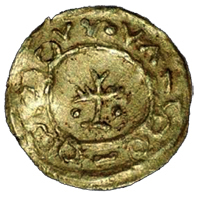 The earliest Anglo-Saxon coins do not carry the name of a ruler, and it was only in the eighth century that the use of a ruler’s name became common on Anglo-Saxon coins. The British Museum holds a Gold tremissis (shilling) of Eadbald of Kent, Anglo-Saxon, AD 616-40, which was minted in London, Kingdom of Kent, England. It is the earliest coin with the name of an English king. A handful of coins are known in the name of Eadbald of Kent who reigned from 616 to 40 AD. Eadbald was converted to Christianity about half way through his reign, and the Christian symbol of the cross was incorporated into minted coins. Coins from the latter part of his reign. bear the legend AVDVARLD REGES meaning ‘Of King Eadbald’.